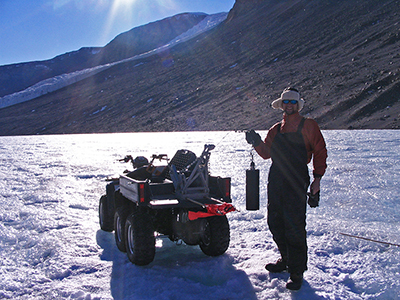 A student carries a sample from an Antarctic lake. The Center for Aquatic and Watershed Sciences (CAWS) was established to promote research and education on the linkages between watersheds and aquatic ecosystems. CAWS brings together faculty, students and staff from several departments in a collaborative environment to address these and many other questions related to watersheds and aquatic ecosystems. Networking of our faculty and students with other scientists through the Global Lake Ecological Network (GLEON) and National Ecological Observatory Network (NEON) are a critical part of our mission. The mission of the Center for Aquatic and Watershed Sciences is to advance aquatic and watershed sciences through synergistic, cross-disciplinary educational and research programs. What Happens on Land Doesn't Stay on Land! Aquatic ecosystems (lakes, rivers, and oceans) receive water from the surrounding landscape, an area of land known as the ecosystem's watershed. But watersheds contribute much more than water to a lake, river, or ocean; for example, sediments, nutrients, and organic carbon also wash into aquatic ecosystems. These materials help nourish and sustain the productivity of aquatic ecosystems. However, humans have greatly modified watersheds and aquatic ecosystems with often detrimental consequences for water quality.